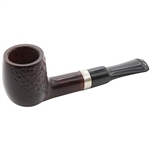 Prince Prestigio Stromboli Ring Briar Pipe - Quality craftsmanship briar pipe is made of real Briar. 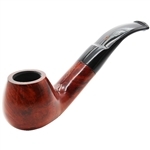 A silver colored ring joins the smooth red matte finish bowl and shank with the Vulcanite stem. Wood grain patterns may vary from picture.